These pint-sized powerhouses, hummingbirds seem to appear from nowhere, flying zig-zag patterns through every bed and border in search of nectar. The nice thing about hummingbirds is that they’re always willing to stop by for a quick snack. Hummingbird feeders, filled with sweet liquid, are one of the more common methods of attracting these always-hungry dynamos (they have to refuel every 10 to 15 minutes). I maintain one of these feeding stations near our back patio so we can enjoy their aerial antics up close. Unfortunately, we don’t always remember to keep our feeder filled, so we also offer a more natural menu by packing our garden with plants and flowers the birds enjoy. Red flowers are on the top of our hummingbird smorgasbord. In fact, many birders believe that the common Ruby-throated Hummingbird seeks out flowers that match the color of the male’s scarlet throat feathers. We’ve found that salvias are particular favorites, especially ‘Lady in Red’, ‘Bonfire Improved’, and ‘Fuego’. 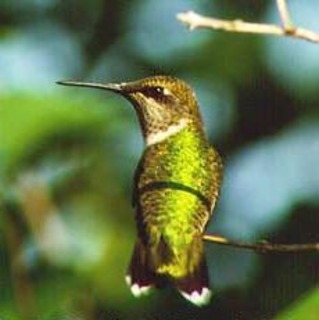 In our garden, we also plant a variety of vines (both perennial and annual) that hummingbirds find appealing. For bumper crops of nectar-rich, red flowers we rely on fast growing annual vines such as ‘Scarlet O’Hara’ morning glory , cypress vine, and scarlet runner bean. Perennial vines that hummingbirds flock to include the common red trumpet vine, ‘Madame Galen’ trumpet vine, and ‘Dropmore Scarlet’ honeysuckle. In addition, we’ve noticed hummingbirds feeding on ‘Empress of India’ nasturtiums, ‘Rose Queen’ cleome, and red geraniums such as ‘Lollipop’, ‘Sincerely Yours’, and ‘Melody Red’. When any of these plants are in bloom, hummingbirds are sure to follow, with both sexes often taking time to engage in airborne turf battles with neighboring hummers. These little birds are a lot tougher than they look, rarely backing down from a good fight when they see a hummingbird they don’t recognize. They also augment their diet of nectar with tiny insects and spiders they capture as they patrol the garden. hummingbird nest is an architectural marvel in miniature. Constructed of down, lichen, and moss, it’s anchored to a tree branch with bits of spider web the parents gather. The cup-shaped, one-inch nest is just big enough to hold the two pea-sized eggs the female lays each spring. Amazingly, the young birds are flying on their own just two weeks after hatching. They generally hang around with the parent birds and will become quite tame by the end of the summer. I have had several hummers in my garden this past week - 3 and 4 at a time. They are noisy little birds chirping at each other and buzzing past me. They love our Turk&#x27;s Cap which is going great guns at the moment.